We showed up at the elementary school in our pajamas, my daughter and I. The smell of freshly delivered pizza wafted through the air, drawing us into the lunchroom, which would soon be overflowing with about 30 giddy, energetic fifth-grade girls, along with 30 quietly nervous, fidgeting parents. If this sounds terrifyingly familiar, then you may recognize this as “the talk,” AKA, that dreaded moment when a dad has to reconcile with the fact that his baby isn’t a baby any longer, knowing full well that the teenage years are right around the corner. Why, you might ask, was I—a man—taking his daughter to an event populated solely by women and their daughters? And if my daughter trusts me enough to ask me to accompany her to a knowingly uncomfortable event, then that is the kind of trust I want to continue nurturing, because it is that trust that will keep our communication flowing freely later in life. As mothers and daughters filled in the last of the tables, the side-eyes and curious glances were painfully obvious, and under other circumstances, might have made me feel overly conspicuous or out-of-place, but not this night. This night, I was there for my little girl. After this, everyone, adult and child alike, took part in an icebreaker. Like a pseudo-bingo game, our goal was to walk around the room, ask each other questions related to the details of puberty, to see if anyone knew the answers. We could only ask one question per person, and the first one to fill up the answer sheet won a prize, but what happened next struck me as intriguingly odd. I tried to be fair and not infer anything from this observation, but instead, continued asking questions. Interestingly though, as the game progressed, the 10 & 11-year-olds in the room seemed more comfortable with the harder questions. Once finished with the icebreaker, we were shown an informational video, circa late-1980s Betamax, and during the video, the characters talked awkwardly about the changing female body (breasts, pimples, body hair, hips, etc. ), how the female reproductive system works, and all the details they ever needed to know about getting their first period. Shrill, nervous giggles pierced the awkward silence as the video played, and with each one, the tension grew. After the video, it was time for questions from the girls. Some girls were brave enough to ask their burning questions publicly, while others chose to submit theirs anonymously via note cards, which were delivered to the nurse facilitating the talk. The questions were honest and brimming with curiosity about the imminent future, but despite the inevitable giggles, they handled the conversation with courage. Observing the adults’ reactions during the event, though, was another story. Many were blushing. Most were whispering. Some looked as though they wanted to be anywhere but in an elementary school lunchroom on a Tuesday evening, talking puberty and menstruation with their daughters. That’s when I had to say something, for my daughter’s sake. 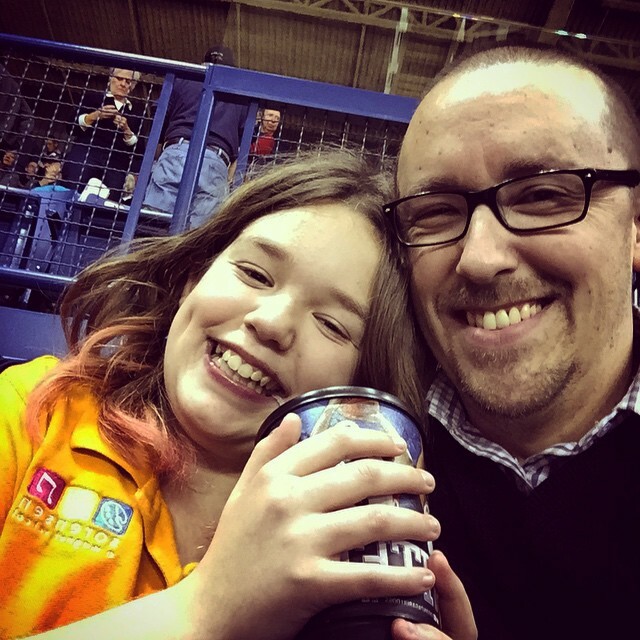 I announced that, if I, as a father—as a parent—treat topics like this as if they are taboo, then why should my daughter feel comfortable talking to me about them? No thanks, I said, I want my daughter to feel like she’s normal and natural, not like a freak who has to hide her femininity from the world. So, I talked about periods. I guessed out loud how much blood a girl loses during each one, and I proudly fielded a question and showed that I know periods last 3-7 days, on average. I had no issue whatsoever with informing others that the typical cycle from one period to the next is usually about 28 days, nor did I take offense with being asked to show the importance of charting said cycles. I reassured my little girl by telling her that, just before starting her period, she might just feel like friends and family are suddenly annoying and intolerable, and that’s all right, because many girls do. I didn’t wince nor whisper when I told her that she might get her period tomorrow, or she might get it five or more years from now, but that no matter when it happens, she is still 100% perfectly normal, no matter how it might feel to her at the time, and that her mother and I will be there for her to answer any questions she might have, no matter what. Lastly, I guaranteed my daughter that I would be available any time she needs me to buy tampons or pads for her, but then I also reminded her that, someday, when she feels like she’s ready for a relationship, that any boy worth her time will feel the same. Any guy too ashamed to tell the world he has a girl with a working uterus at home is not worth her time or attention. It’s time that fathers take a more active role in educating and raising their daughters to accept themselves for all that they are and ever will be. It’s time for all parents, but especially dads, to stop treating topics like menstruation and puberty like it is handling a contagious disease. It’s time for all of us to make our daughters (not to mention other girls & women) feel less like a dirty secret and more like the valuable yin to our yang that they truly are. Kudos, this is kicking the door down for male/father stereotypes and raising girls. Good for you Dad! Your daughter is very blessed to have you by her side. This is awesome. Your daughter will be blessed to have you by her side! Bravo, Mindful Dad! I join you in being a Infinite Mindful expression of Love to our daughters, sons, mates and the rest of the world. Thanks, Sharon, but my children make me feel like I’m on the receiving end of those blessings. Josh, I already noted how cool this was, in other venues. And I second that here. I think it’s really important for parents to not be skittish about this stuff. There is a difference between privacy and embarrassment; we can discuss private things, privately, but without shame. You may be interested in when I had “the talk” with my son: http://tmblr.co/ZJZiexKgevyI . Dude–this line: Any guy too ashamed to tell the world he has a girl with a working uterus at home is not worth her time or attention.— I’m going to save that in the mental rotation for down the line. Very nicely done! *slow clap* Freaking thank you!!! Read this to my husband, and I shared it on every social media site I have. Such clever work and exposure! Keep up the awesome works guys I’ve added you guys to our blogroll.